Small - $66.99 Medium - $66.99 Large - $66.99 X-Large - $73.99 Only 5 left! 2X - $66.99 Only 8 left! On Christmas Eve, Santa Claus has a big job. He has to deliver toys to every single good boy and girl in the world. That’s got to be one stressful job! We often wonder how he blows off steam! Does he play a few video games? Perhaps he puts a smooth jazz vinyl on his record player and sits back in his reclining chair. Wait, we know! He probably heads down to the golf course to knock the old ball around for a bit! Yeah, Santa is a golfer. Finally, with this Tipsy Elves sweater, we have some irrefutable proof! We can almost hear him yelling, “FORE!” on it! This ugly Christmas sweater is a knit sweater made from acrylic. It has a cozy fit, perfect for those chilly winter months, but the absolute best part of this sweater is the front. It features visual proof that Santa Claus knows how to golf! It also features snowflake designs on the sleeves and striped accents to give it that extra holiday flair. Your choice is pretty easy for the next ugly Christmas sweater party! 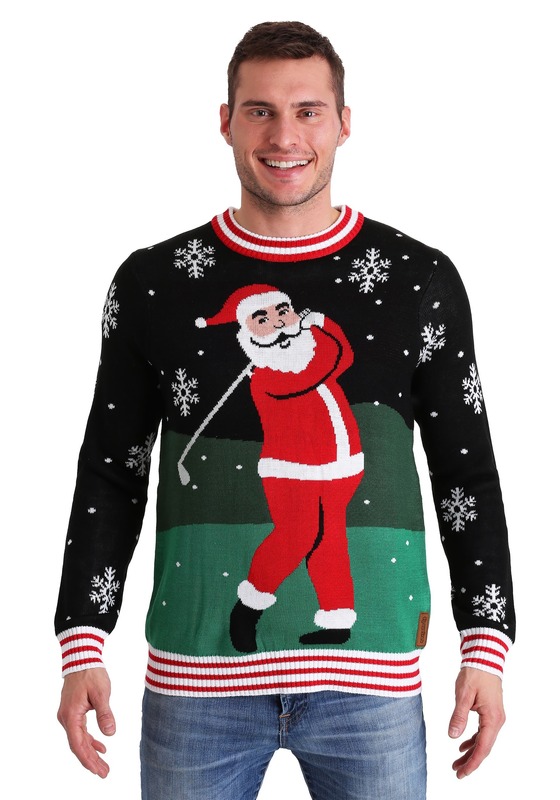 Wear the one that officially proves Santa as a notorious golfer during the rest of the year.